This is part of a five-part report on my summer #JournovationTour of innovative digital journalism outfits and startups. The first stop on my tour was The New York Times. In April at ISOJ, I heard a talk about Snow Fall by New York Times graphic artist Hannah Fairfield, and I wanted to learn more about how that groundbreaking package was put together so that we as journalism educators can guide students in that direction. 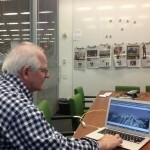 She connected me with sports graphics editor Joe Ward (pictured above) and programmer Jacky Myint, who did all of the Jquery programming that made it possible. There are a lot of things about Snow Fall that make it an example of great digital journalism, but what struck me most was two things: 1) the way in which the interactive elements pull you through and, in the style of a good novel, remove the fatigue that sets in with some long-form pieces; and 2) the degree of integration between the text and interactive elements. You can see examples of both in the chapter, The Descent Begins. As you scroll down the page, you eventually get to a graphic of a mountain. As each skiier’s experience is described in the story, the person’s name is highlighted and you see the skiier’s path down the mountain. Being semi-tech myself, I asked Jacky how this was accomplished without relying on something like Flash. It turns out that she once specialized in ActionScript, which she learned while earning a Masters in Fine Arts from Parsons, but as Flash went out of style she refocused on HTML, CSS and JQuery. Many of the scroll-based effects in Snow Fall are coded in Jquery using the Reel.js plugin. Commonly used in advertisements, the Reel.js plugin is described as an alternative to Flash and Java for creating 360-degree object movies, vistas and panoramas. I know that’s a lot of geekspeak. For what it’s worth, I’ve asked Jacky if she can provide some easy tips for journalists who aren’t hard-core programmers who want to create their own scroll-based events and stories like this. She hasn’t answered yet so I take that as a sign that I’m oversimplifying the question. In other words, to do something like this you really need to work side by side with an experienced JQuery programmer. 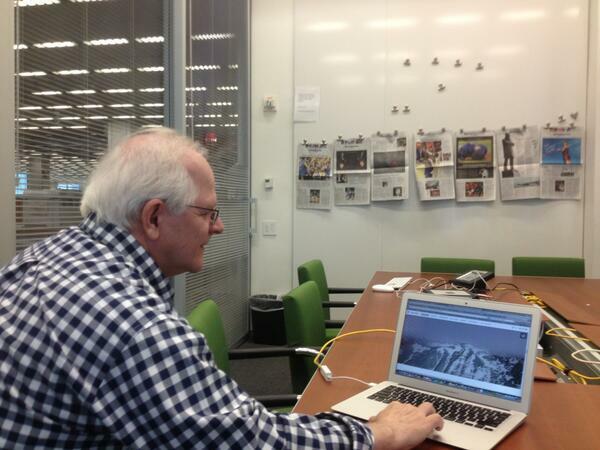 NYT Graphics editor Joe Ward showing the parallax scrolling features of Snow Fall. But there’s another interesting back story to what made that decision easier. There used to be three departments, Graphics, Multimedia and Interactive News, with overlapping focus, and they sometimes competed for attention and resources. After one department disappeared due to the departure of a team member, the programmer was suddenly working side by side with a 3D animator and the traditional organizational barriers to collaboration disappeared. So you hear that, digital news editors? Get your disparate teams together at the beginning of a story, not the end. Maybe even combine departments or, at the very least, create interdisciplinary teams that are ready to jump on a big story from day one. Otherwise you will end up with something like this whimsical example from the Time’s Aaron Pilhofer of how Snow Fall would have looked without an integrated approach. Or you’ll produce a nice, but not very interactive, video like the Times’ Punched Out. Those are my takeaways from the New York Times visit. Thank you to Joe Ward and Jacky Myint for taking time out of their busy schedules to talk with me. I know our students at Newhouse would love to hear more! Nonny de la Peña had this to say about Professor Pacheco after her acceptance of an I-3 Mirror Award. This entry was posted in Journovator Interviews.